William Morrow Cookbooks, 9780060958374, 480pp. Craving hush puppies but you live in Boston? Need a peanut butter fix that Skippy won't satisfy? 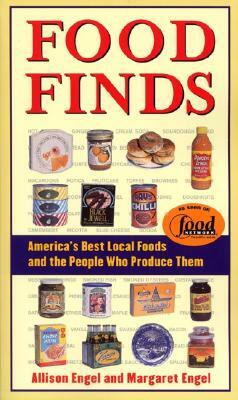 Search no further than Food Finds, the celebrated guide to America's diverse and delicious bounty of regional foods and specialty products. Fully updated and exhaustively researched by authors Allison Engel and Margaret Engel, this comprehensive resource contains up-to-date mail and online ordering information for more than 400 of America's best local and specialty food producers, from the Santa Barbara Olive Company to DiCamillo's Bakery to the candy-making nuns at Mount St. Mary's abbey. Also included are colorful anecdotes, photos, and visitor information. Engagingly written and cleary organized, Food Finds is the essential tool-time for favorite, or eaters interested in America's rich and varied culinary traditions. Margaret Engel directs the Alicia Patterson Foundation, the oldest journalism writing fellowship program. She is a former Wahington Post reporter and co-author of Fodor's Baseball Vacations. She lives in Bethesda, Maryland.